At Kings Furlong Junior School, we believe that pupils engage and achieve most in a creative, relevant and contextual curriculum, which is underpinned by rigour, challenge and opportunity. The staff have high standards, and this permeates through all that they do. At our core, we value respect, care, enjoyment, community, service and excellence. We want our children to develop creativity, team work, resilience, responsibility, respect, risk taking, and curiosity. This is so that in life they are able to solve problems, plan effectively, make healthy choices, show empathy, be organised, communicate well, be numerate and literate, demonstrate independence, think critically, be safe, use ICT effectively, adapt to changes, and be resourceful. All that we do in school is for the sake of our pupils becoming life long, successful learners, who enjoy themselves and make a positive contribution to our society. Excellence: All adults and children take pride and do their very best in all that they do. We strive to improve on our current abilities, and are never satisfied with second best. Enjoyment: Across all activities, there is a sense of enjoyment, especially in the knowledge that challenge and perseverance breeds progress, success and pleasure. We believe that life is meant to be enjoyed, and that central to that enjoyment is learning. Confidence: We believe that children should develop in confidence, so that they are able to take hold of opportunities, and be independent and successful citizens. Care: We strongly believe that we need to look after each other, and demonstrate care for those around. We want to develop a greater sense of care and compassion in our pupils. Service: We want to instil in our pupils an attitude of service, and provide opportunities for serving others in a variety of ways. Community: We believe that no person is an island. We celebrate the fact that we live in and amongst a variety of communities, and believe that we can learn more about ourselves through learning about others, and engaging with them. We value our strong links with local faith groups. At Kings Furlong Junior School, we aim for our pupils to be life-long learners. To accomplish this, we develop in them behaviours which underpin and enable successful and deeper learning. We want them to be curious about why things happen, to take risks, to reflect and evaluate, to learn about and demonstrate respect and responsibility, to be resilient through the difficult times, to work in a team effectively, and to have creative ideas and imagination. We cannot teach our pupils everything they will need to know, so we must help them learn how to learn. Further, we have matched an animal to each behaviour, to help children learn and relate to them. Through our conversations with children, assemblies, marking, lesson activities, and extra-curricular activities, we promote and develop our learning behaviours in our pupils. Building on our core values and learning behaviours, we ensure our pupils have practical life skills, which enable them to succeed whatever they turn their hand to. One day, they will be the doctors, mechanics, scientists, carers, teachers, leaders, business owners, or prime ministers, and we are passionate about equipping them with the tools they will need for success. Therefore, using our curriculum as the vehicle, we aim to develop these skills in our pupils, and recognise that they must have opportunities to do this. At Kings Furlong Junior School, we offer a curriculum that is rich, relevant and contextual. 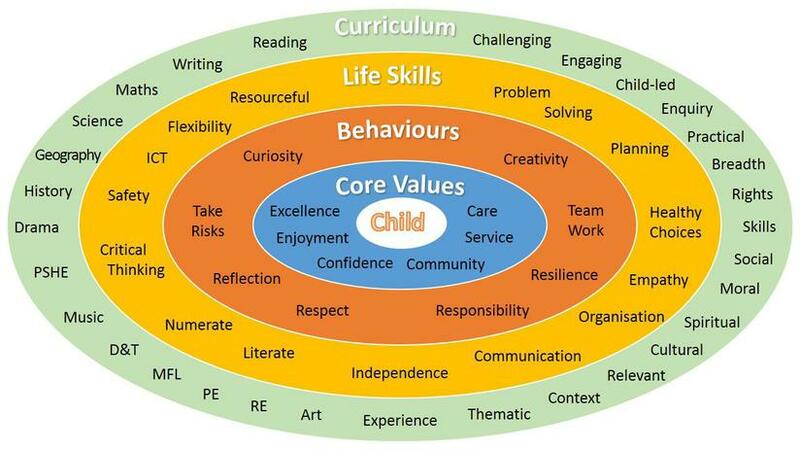 It is child-led, thematic, and responds to the needs of our pupils. It engages them in their learning through exciting, outcome-based projects, which create a thirst for learning, as well as opportunities for satisfying that thirst. Our curriculum is also skills based. This means that we teach and develop the learning behaviours and life skills, and that they are at least as important as traditional subject knowledge. Pupils need a solid grasp of English, Maths and ICT skills, and they need to be able to apply these skills in various different contexts. Importantly, all of our activities at school are underpinned by a high-level of challenge and rigour. This ensures that our pupils are constantly learning, being pushed, and reaching their potential. We feel strongly that higher order thinking, questioning and tasks stretch and challenge our pupils, whatever their ability. The use of Bloom’s taxonomy in planning ensures our pupils are ‘in the zone of learning at the higher levels’. In order for you to understand our curriculum more, do take a look at our Teaching and Learning Policy . How are subjects taught so that learning is purposeful and interesting? The curriculum is predominantly delivered through multiple projects in each year group. Every project has 3 ‘main’ taught subjects, one of which is always English. The 2 applying subjects support the learning and the project outcome. Maths is taught discretely every day with links made to support project learning whenever possible. RE, music and modern foreign language (French) will be taught discretely when there are not learning opportunities connected to a project. PE is taught discretely. An outcome is the culmination of all that the children have learned in a project. It may be a piece of work, an activity, a presentation, a play, a performance, or a workshop. The key is that the children put together their knowledge and skills in a way that is purposeful, interesting and fun! What was the Ancient Egyptians greatest achievement? What is most important within our solar system? Is Britain becoming a more just society? How clever were the Stone Age people? Is it important that materials change state? How do my actions affect polar bears? Animals including humans, living things and their habitats. Include old age. Is it important to maintain a healthy lifestyle? How are human and animal bodies the same and different from each other? Should humans be allowed to live near volcanoes? Study of Greek life and achievements and their influence on the western world. What is the greatest legacy of the Ancient Greeks? Is it right for the carnival to cost so much money when there are so many people live in poverty? Living things – habitats and plant life. Where is the most effective location for plants to grow? What makes your tribe more successful at survival? Use of forces to create aeroplanes for flight competition. Which is the most important force to mankind? Mayans or Britons – Who had it best? Don’t need to do mountains – let me know. Are mountains beautiful or dangerous? Should schools force children to wear cycle helmets to school? Is it right to call Alfred great? Should children’s snacks always be healthy?